Alexander Hamilton is born on the British island of Nevis in the West Indies, the second of two boys. His father James is a Scottish trader of noble ancestry. His mother Rachel Faucett, of French descent, is still married to another man at the time. Several biographical accounts will put the year of Hamilton's birth as 1757. The Hamiltons move to the Danish island of St. Croix, but James soon leaves his family, and Alexander never sees his father again. Britain passes the Stamp Act to raise revenue from the American colonists to help pay Britain's war debts. The law touches off a decade-long dispute over British authority in America. February 19: Alexander's mother Rachel Faucett dies of yellow fever. Alexander nearly dies at this time. November 11: Chafing at a clerk's existence and anxious to prove himself, 14-year-old Alexander writes to a friend: "I wish there was a War." March 5: The killing of civilians by British soldiers, quickly dubbed the Boston Massacre, inflames tensions already simmering in England's American colonies. The soldiers are put on trial; local lawyer John Adams undertakes their defense. 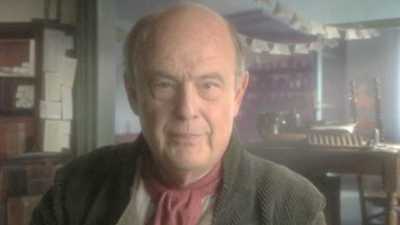 Cruger and a small group of local people provide funds to send Hamilton away to a grammar school in New Jersey. Hamilton goes to New York to begin studies at King's College (which will become Columbia University). Hamilton writes his first political pamphlet, "A Full Vindication of the Measures of Congress," supporting the right of the First Continental Congress to authorize a trade boycott of England. Hamilton signs himself, "A Friend to America." April 19: The first shots of the American Revolution are fired at the battles of Lexington and Concord. Hamilton soon joins the New York State provincial militia. May 10: Despite supporting the revolutionary cause, Hamilton, who detests mob violence, tries to talk a group out of attacking King's College president (and loyalist) Myles Cooper. Hamilton delays the mob long enough for Cooper to escape. King's College closes, and Hamilton is unable to complete his degree. March 14: Hamilton becomes captain of the 1st Battalion, 5th Field Artillery Unit. (Today, the unit is the oldest still existing in the United States Army and the only one remaining from the Revolution.) Hamilton conducts himself with skill during General George Washington's subsequent retreat through New York, and draws the Continental Army commander's attention. July 9: The Declaration of Independence is read for the first time in New York, having been adopted by the Second Continental Congress on July 4. December 26: Hamilton's artillery unit takes part in Washington's successful capture of Trenton, New Jersey. January 3: Hamilton participates in the battle of Princeton. March 1: Washington promotes Hamilton to lieutenant colonel and makes him aide-de-camp. The two men become close as Hamilton aids Washington in the complex administrative task of running a war. June 28: Hamilton fights in the battle of Monmouth and has his horse shot out from under him. March 14: In a letter to Continental Congress president John Jay, Hamilton proposes an idea initiated by fellow aide John Laurens of recruiting slaves for the Continental Army and offering them freedom in exchange for their service. Hamilton detests slavery, considering it a terrible waste of human potential. February: Hamilton renews his acquaintance with Elizabeth Schuyler, daughter of wealthy General Philip Schuyler, whom he had met briefly in 1777. They fall deeply in love and will become engaged in March. October 5: "I love you too much," Alexander writes Elizabeth. "You engross my thoughts too [e]ntirely to allow me to think of any thing else." They will marry on December 14. 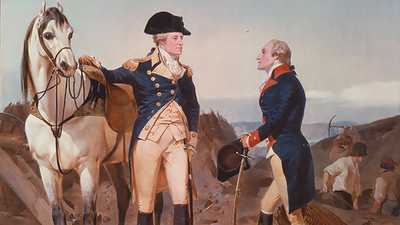 February 16: Hamilton and Washington quarrel following the general's accusation that Hamilton has shown disrespect. Hamilton resigns from Washington's staff, writing, "The Great man and I have come to an open rupture." But after Hamilton refuses Washington's apology, a reconciliation follows. April 27: Ever eager for action, Hamilton requests a field command, but Washington turns him down. October 14: Hamilton rides down to Yorktown from New York, desperate for his last chance to earn glory on the battlefield. He ultimately leads combined American and French soldiers in a successful charge against a fortified British position at Yorktown in Virginia. English commander Lord Cornwallis surrenders five days later. November: Hamilton leaves active military service. January 22: Elizabeth gives birth to the first of the couple's eight children, a son named Philip. July: Hamilton is made receiver of continental taxes for New York. November: Hamilton arrives in Philadelphia as an elected representative to the Continental Congress. March: New York enacts the Trespass Act, allowing patriots whose homes had been seized by Tories during the Revolution to recover damages. This statute violates a provision of the Treaty of Paris, which will ban state laws interfering with debts and contracts between Patriots and Tories. September: The Treaty of Paris officially ends the American Revolution; the last British troops will leave New York City two months later. By year's end the Hamiltons will have taken up residence at 57 Wall Street in New York. May 12: Against a backdrop of rising violence towards Tories who have remained in New York, the legislature strips most of them of the vote for two years. Hamilton argues against these sort of punitive measures, writing, "The world has its eye on America." He has also taken up the defense of Tories fighting claims under the Trespass Act. June 9: The Bank of New York, which Hamilton has helped establish, opens its doors. June 29: Hamilton argues his first Trespass Act case, Rutgers v. Waddington, in the Mayor's Court of the City of New York. He urges the judges to strike down the law as a violation of the law of nations and secures a favorable settlement for his Tory client. Although harshly criticized for his actions, Hamilton eventually takes 45 more Trespass Act cases and gains notice for his skilled advocacy. September: Angelica, the Hamiltons' second child, is born. February 4: At a meeting in New York, Hamilton and 31 others set forth the guiding principles for an anti-slavery group, the New York Society for Promoting the Manumission of Slaves. The society pledges not only to show compassion towards those held in captivity but also to work towards their freedom. April: Hamilton is elected to the New York legislature. The next month he will be appointed a delegate to a convention in Annapolis, Maryland, called to establish regulations governing interstate trade. September: Delegates at the Annapolis Convention issue a report drafted by Hamilton to all 13 states recommending that a general convention be called to meet in Philadelphia to render an American government adequate to the needs of the Union. Hamilton, with his friend James Madison of Virginia, becomes a key leader of the movement to strengthen the general government of the United States. May: A third child, Alexander, is born to Alexander and Elizabeth Hamilton. May: The Constitutional Convention convenes in Philadelphia. Hamilton is one of three New York delegates, but the only one who supports the creation of a strong new federal government. He serves on the committee that writes rules for the convention, but has little to do with the drafting of the new Constitution itself. Hamilton's own proposal, in which senators and a national governor would serve "during good behavior," attracts almost no support. Hamilton, frustrated at being outvoted in his delegation and needing to raise money to support his family, will leave the Convention in late June to practice law in New York. He only returns to the Convention in its last weeks. September: After working through the summer, the Convention's delegates, including Hamilton, approve and sign the proposed Constitution and send it to Congress, which in turn sends it to the states. Nine of the 13 must ratify it for the document to take effect. The first three states will do so by the end of the year. October: Hamilton, James Madison, and John Jay begin writing The Federalist, more popularly known as The Federalist Papers. These 85 essays supporting ratification of the Constitution appear in various New York newspapers starting this month and continuing until May 1788. Each essay is signed "Publius." Hamilton writes 51 essays, Jay five, and Madison 29. In Federalist Number 1, Hamilton describes the stakes: Americans will decide "whether societies of men are really capable or not of establishing good government from reflection and choice, or whether they are forever destined to depend for their political constitutions on accident and force." April: A fourth child, James Alexander, is born to the Hamiltons. June: New York convenes a ratification convention at which Hamilton and his Federalist delegates are outnumbered nearly three to one. Hamilton takes a leading role in the debates, defending the proposed Constitution with eloquence and force. His position is strengthened when the convention receives news that the influential state of Virginia has become the tenth state to ratify. On July 26, New York becomes the eleventh state to ratify the Constitution, guaranteeing that the Constitution will become the new nation's form of government and that New York will remain the new nation's capital at least for a time. In the last of The Federalist, Hamilton anticipates the end result: "The establishment of a Constitution, in time of profound peace, by the voluntary consent of a whole people, is a PRODIGY, to the completion of which I look forward with trembling anxiety." George Washington becomes the nation's first president and nominates Hamilton to be the first Secretary of the Treasury. The Senate swiftly confirms him without debate; Hamilton's father-in-law, General Philip Schuyler, one of New York's senators, votes for his son-in-law's confirmation. A confirmed Anglophile, Hamilton watches the start of the French Revolution with trepidation. September: The House of Representatives directs Hamilton to submit a plan for the support of the public credit when Congress reconvenes in January 1790. Hamilton works to organize chaotic national finances, collecting information, establishing standards and procedures, and devising a plan for restoring the financial health of the near bankrupt American republic. 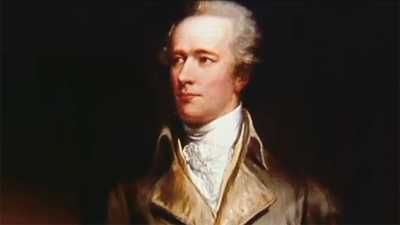 January 14: Hamilton, submitting his "First Report on the Public Credit," argues for a federal assumption of all state debts to stimulate the economy and strengthen the Union. 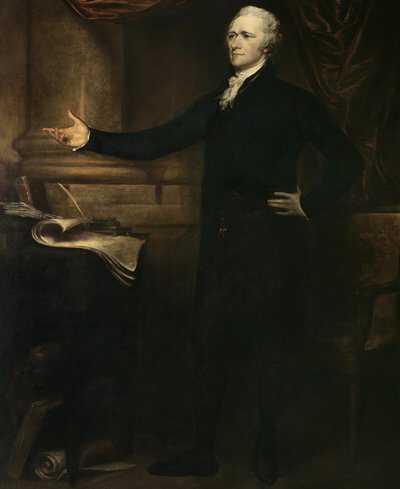 June 20: With his plan under heavy attack in Congress, Hamilton dines at the New York home of Secretary of State Thomas Jefferson and there strikes a deal with Madison which will ensure Virginia's support for federal assumption of state debts in exchange for Hamilton's agreement to encourage northern members of Congress to move the nation's capital to Philadelphia for 10 years, and then to a Southern site on the banks of the Potomac River. July 10: The House passes a bill making Philadelphia the nation's temporary capital, to be moved later to a site selected on the Potomac. Later that month, Hamilton's assumption plan is narrowly approved. December: Hamilton submits a report to the House calling for the chartering of a national bank, which he argues will increase the circulation of currency and assist the financial operations of the national government. February: Madison, Jefferson and Attorney General Edmund Randolph object to Hamilton's plan for a national bank, declaring it an unconstitutional extension of the powers of the federal government. Washington asks Hamilton to defend the proposal, which he does in a lengthy treatise arguing that the Constitution gives Congress "implied powers." Washington signs the bill into law. Convinced that the strong central government Hamilton advocates is a threat to both state and individual liberty, Jefferson and Madison form the Republicans, a partisan alliance that becomes the nation's first opposition political party. In an election for the New York Senate seat, an ambitious -- and many would say unscrupulous -- Republican, Aaron Burr, defeats incumbent Philip Schuyler, beginning a political rivalry between Burr and Hamilton. Meanwhile, the Secretary of the Treasury continues to churn out reports, advocating a federal mint and promoting manufacturing. That summer he begins an affair with Maria Reynolds, whose swindler husband will eventually extort some $1,000 (well over $10,000 in 2006 dollars) in hush money from Hamilton. Republicans accuse Hamilton of financial impropriety and investigate him. May 26: In a letter Hamilton declares himself "unequivocally convinced of the following truth: That Mr. Madison cooperating with Mr. Jefferson is at the head of a faction decidedly hostile to me and my administration, and actuated by views in my judgment subversive of the principles of good government and dangerous to the union, peace and happiness of the Country." Bitter partisan wrangling between Hamilton and his allies and Jefferson, Madison and their allies will dominate the national press and convulse the president's cabinet. August: A fifth child, John Church, is born to the Hamiltons. April: Washington issues a proclamation of neutrality towards France, refusing to join France in its declaration of war on Great Britain. Hamilton defends the decision in seven newspaper essays signed "Pacificus." Madison responds in a series of essays under the name "Helvidius." August: A yellow fever outbreak begins in Philadelphia, causing most of its residents, including Washington and Hamilton, to flee the city. By the time the epidemic subsides in late October, about 5,000 people will have died. Both Hamilton and his wife Elizabeth contract the disease but eventually recover. Jefferson resigns as Secretary of State and returns to Virginia, leaving Hamilton in a commanding position in Washington's cabinet. January 19: Hamilton submits his final financial report to Congress and resigns as Treasury Secretary soon afterward. He and his family leave Philadelphia in February and return to New York, where Hamilton, whose government salary has never matched his expenses, returns to the law. Hamilton works closely with Washington on successive drafts of Washington's farewell address; John Adams, who has served as vice president for two terms, is elected Washington's successor in the first contested presidential election in U.S. history, receiving 71 electoral votes to Jefferson's 68. At the time, votes for president and vice president are not made separately; the person receiving the most electoral votes takes the higher office, and the runner-up takes the vice presidency. Hamilton, who has developed a strong dislike for Adams, has been secretly maneuvering to drop the candidate's electoral total below that of fellow candidate Thomas Pinckney of South Carolina. But the plan backfires when several Federalists in New England learn of it and refuse to vote for Pinckney at all, leaving him in third place and ensuring that Adams' chief electoral rival, Thomas Jefferson, becomes his vice president. Burr, running as a Republican, places a distant fourth. Schuyler defeats Burr and is re-elected to the U.S. Senate. Meanwhile, a pamphlet published by james Callender accuses Hamilton of financial and marital improprieties with Maria Reynolds, leading Hamilton to make a stunning printed confession. In his "Observations on Certain Documents," published on August 25, Hamilton angrily denies that the money paid to Maria's husband was for financial speculation or that he used his position as Treasury secretary for any personal gain or corrupt purpose. "My real crime," Hamilton admits, "is an amorous connection with his wife for a considerable time," and he prints many love letters detailing the adultery. While candid, Hamilton's confession humiliates his wife, disheartens his supporters, and delights his foes. "It is worth all that fifty of the best pens in America could have said [against] him," one opponent writes to Jefferson. But Washington, now in retirement at Mount Vernon, stands by Hamilton. August: A sixth child, William Stephen, is born to the Hamiltons. June 3: Hamilton's father James dies. November: A seventh child, Eliza, is born to the Hamiltons. December 14: Hamilton's longtime patron George Washington passes away. "Perhaps no friend of his has more cause to lament on personal account than myself," Hamilton writes. As the result of a secret peace mission to France launched by President John Adams, Congress directs Hamilton to disband the army that Washington and he have assembled; his military service officially concludes in July. The election of 1800 pits Adams against Jefferson again, with Burr once more running as a Republican, supposedly for the vice presidency. Hamilton cannot support his enemy Adams, whom he terms in a private letter "unfit ... for the office of chief magistrate." Hamilton pens a pamphlet for private distribution to leading Federalists making the case that they should switch their support from Adams to his running-mate, South Carolinian Charles C. Pinckney. Burr discovers the pamphlet and makes it public; the furor splits Federalist ranks and helps to ensure that the next president will be a Republican. Jefferson and Burr each receive 73 electoral votes, requiring the House to choose America's third president. Hamilton writes, "If there is a man in the world I ought to hate, it is Jefferson. With Burr I have always been personally well." But Hamilton considers Burr to be immoral, animated solely by personal ambition, and dangerous, so he sides with Jefferson, unleashing a flurry of letters that claim Burr "has no principle, public or private," and is in fact "one of the most unprincipled men in the United States." Hamilton begins constructing a country house in upper Manhattan, naming it "The Grange." February 17: After months of political intrigue and a week of deliberation, the House makes Jefferson president on the 36th ballot. With some Federalist acquiescence, ten state delegations back Jefferson, while four support Burr and two abstain. Republicans will hold the presidency for the next 24 years. November 16: The New York Evening Post, a newspaper Hamilton and a number of other leading Federalists has founded, publishes its first issue. November 23: Philip Hamilton, who in an attempt to defend his father's honor challenges George Eacker to a duel, is mortally wounded at Weehawken, New Jersey, and dies the next day. Hamilton, who has unwittingly encouraged his son's actions, is devastated, and grief drives Philip's sister Angelica insane. Hamilton and his family move into the Grange. Maintaining the home will prove financially burdensome. June: An eighth child, Philip, is born to the Hamiltons. March: Dropped by Jefferson and his allies from the Republican re-election ticket, after four years of distrust Burr decides to run for New York governor. Both Jefferson and Hamilton oppose him, and Burr loses by a wide margin. April: A published letter asserts that Hamilton has expressed a "despicable opinion" of Burr without providing specifics. June 18: Burr writes to Hamilton demanding an explanation, which Hamilton does not provide. Hamilton wants to respond to a specific insult -- which Burr cannot provide. A series of letters over the next few days escalate tensions until arrangements are made for a duel on July 11, to be held at Weehawken. July 11: Hamilton is mortally wounded by Burr and dies the next day after suffering considerable physical agony. July 14: Hamilton's body, accompanied by enormous crowds, is the centerpiece of a massive funeral procession, ending with Hamilton's burial at Trinity Church in lower Manhattan. Elizabeth, now widowed and with her youngest child just two years old, is left in desperate financial straits, a situation somewhat ameliorated by the death of her father four months later. Despite her own financial difficulties, she takes part in many charitable activities throughout her widowhood. Elizabeth persuades Congress to restore the military pension that Hamilton had declined. November 9: Elizabeth, who has outlived her husband by five decades, dies at the age of 97.